The IT-People Awards for Excellence in Information Technology is aimed at recognizing organizations & individuals who have contributed value to business strategically & made a difference. The IT-People Awards for Excellence in Information Technology will honour visionaries, recognizing IT stars with a belief that excellence still counts. The awards discussed, debated & recognized by an independent jury aims at recognizing the Entrepreneurship with competencies that drives business. 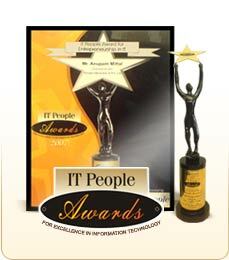 IT People Awards for Excellence in Information Technology; is an endeavour of IT People Ltd. to recognize individual�s contribution in the field of Information Technology in the areas such as Leadership style, Entrepreneurship, Innovation, HR Practices, Young Achiever and many more.